Fantastic colors! Gorgeous bright fire flash pattern. This stone just lights up with beautiful multi-color fire! 4 out of 5 in brightness, very bright! The opal is N5 in body tone! Looks great under any light! It would make an amazing ring or pendant! This stone is top quality. Perfect cut and polish. * Body tone is N5 dark. * The size of the stone is 15.5 x 11 mm. * Thickness of the stone is 4.5 mm. Slight dome. * The weight of the stone is 5.10 ct.
Don't miss out on this truly beautiful solid semi-black opal! BUY WITH CONFIDENCE! I am an honest seller. Shipping Charges: To USA FREE, Australia FREE, Rest of the world FREE for insured air mail. Contact me for more shipping options! All the opals i sell are professionally cut and polished by me. I have been in the wholesale opal business for over 20 years. Selling to exporters and retail shops. 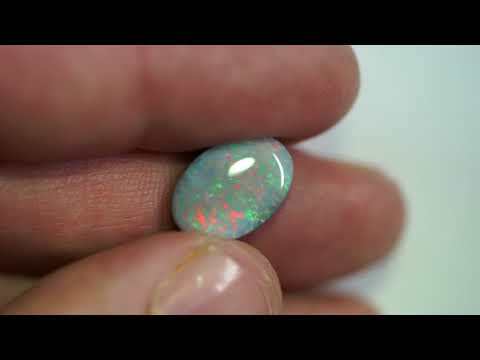 You are guaranteed to get the best possible quality for the best possible price when buying from me.All the opals that I sell are solid Lightning Ridge opals that are NOT treated in any way.